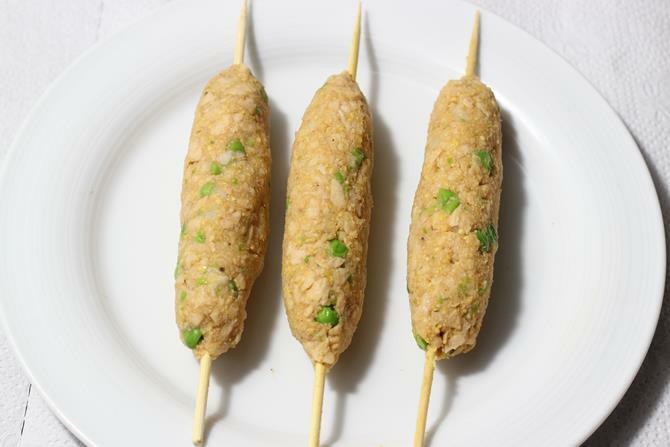 Veg seekh kabab recipe – Delicious veg kabab recipe made using veggies like potatoes, peas and textured vegetable protein i.e Soya granules or chunks. Seekh kabab is usually made of minced meat and grilled on skewers in a charcoal or tandoor oven. 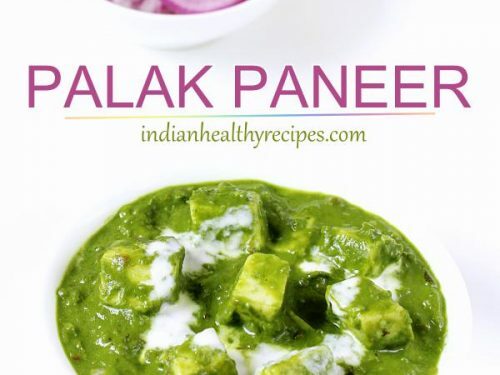 It is served with mint chutney, onion and lemon wedges. 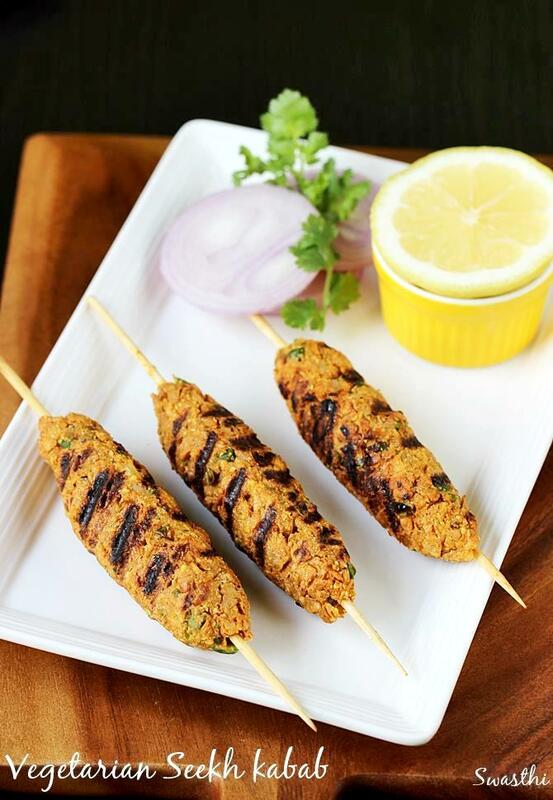 Due to the use of soya granules or chunks this veg seekh kabab tastes very close to the meat seekh kebab. 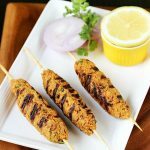 This recipe can also be used to make vegetable seekh kebab (without the use of soya), just skip soya and use different variety of veggies. I have used organic soya granules and highly recommend using the same as the non-organic ones are mostly made from GMO soya bean which is not good for health. 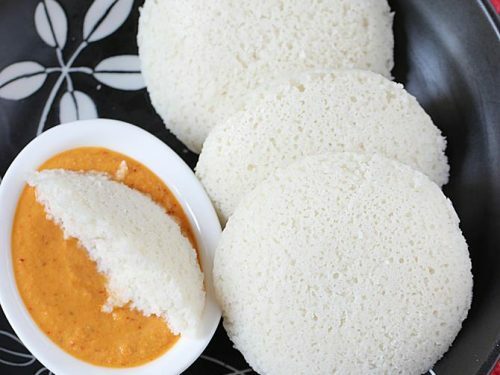 Since Soya chunks & granules are processed food, limit the usage to 1 to 2 servings per week. I had few requests for meat seekh kabab, since we do not eat meat often sharing this one. 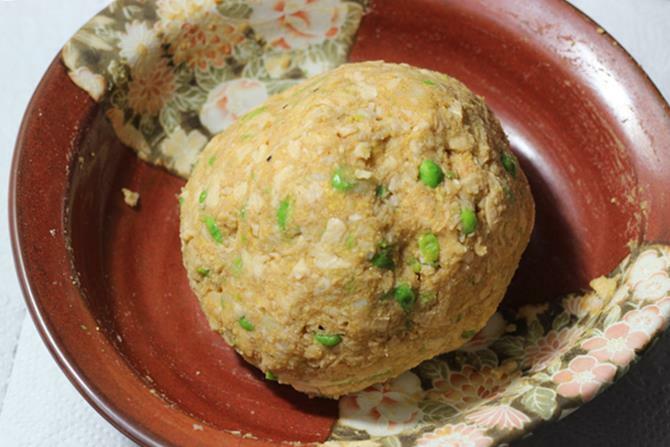 To make mutton sheekh kebab, use tender minced meat and substitute it for soya. 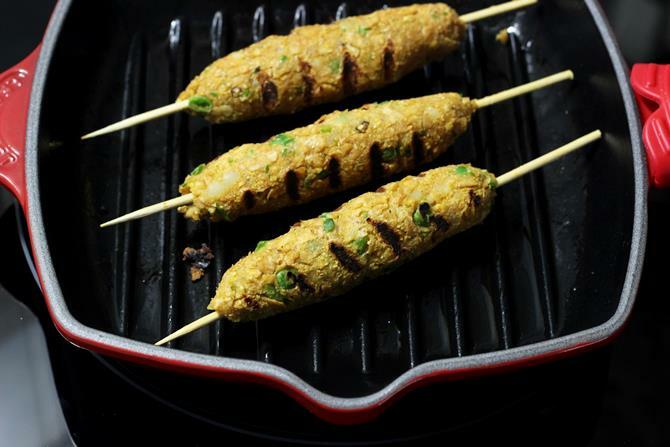 Grilled vegetarian kebabs made using soya and vegetables like potatoes and peas. These make a great starter or a snack. Boil or steam green peas and potatoes (sweet potatoes) just until done without turning them mushy. Add soya to hot water and allow to soak until softened. Drain off and squeeze up excess frothy water. Rinse them twice more with cold water and squeeze off well to remove excess water. 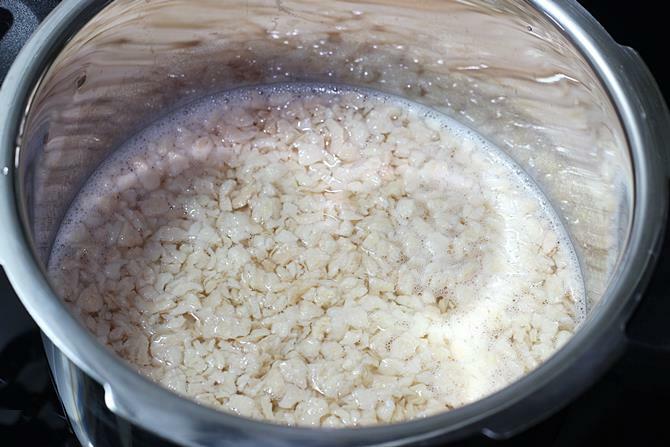 If using chunks you can pulse them in a mixer few times to make them coarse granules. Dry roast the flour until it turns aromatic. 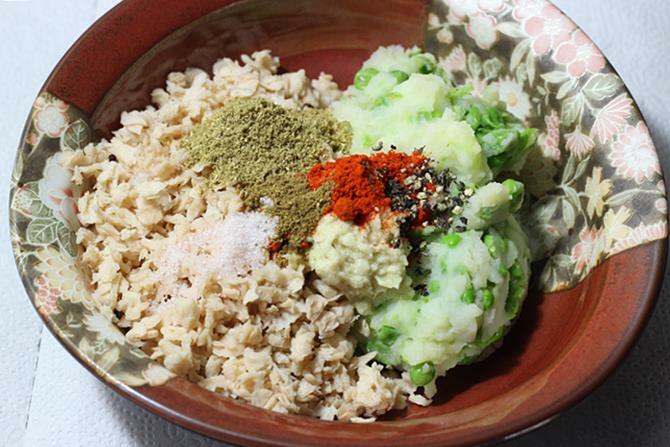 Mash the veggies and mix them with soya and ginger garlic paste. Add rest of the ingredients except oil and mix well. The mixture must resemble a dough. If the dough is too sticky or crumbly or falling apart then add little more besan. Divide the dough and make 9 equal portions. Roll them on skewers about 3 to 4 inches long. Grease your grill pan and heat. Or preheat the oven to 220 C for about 15 mins. Place them and grill. 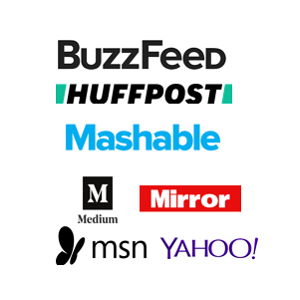 Rotate them every 5 to 7 minutes to the undone part. Grill until done or for about 30 mins. Do not flip them until they are cooked, else it will stick to the pan. When they are half done, place a slice of onion on the grill for smoky flavor. When the kebabs are golden, increase the flame to maximum and grill for few minutes. If doing in oven move it to the top rack and grill for 5 mins. 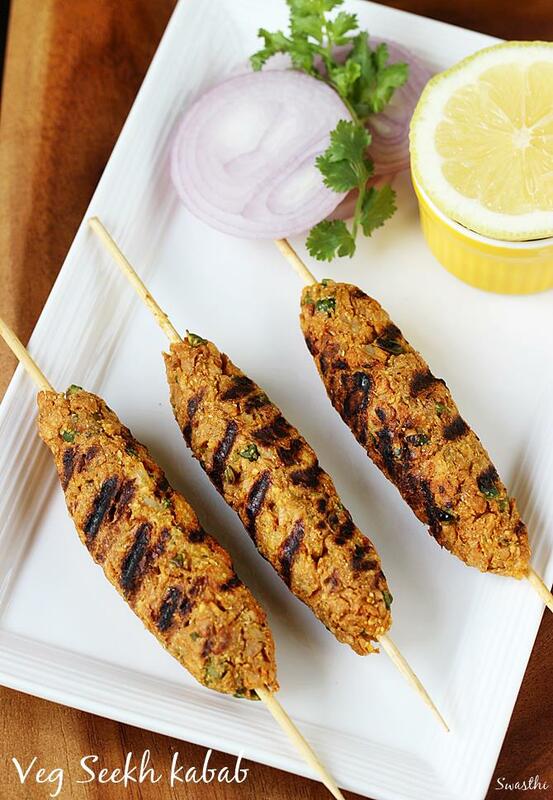 Serve veg seekh kabab hot with mint chutney, onion and lemon wedges. 1. 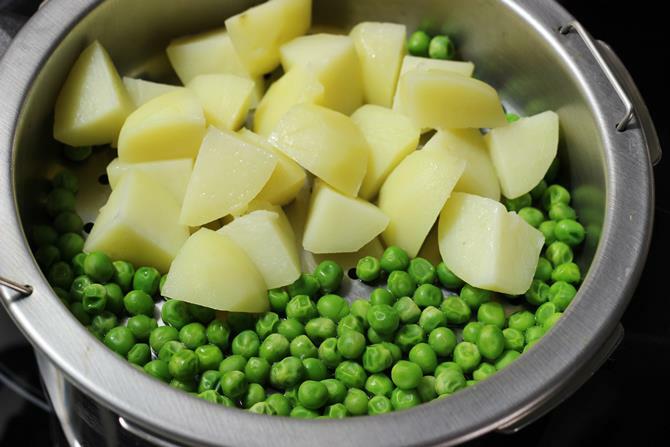 Steam or boil potatoes and green peas until just cooked. Do not over cook and make them soggy. I steam them in a pressure cooker. Diabetics can replace potato with sweet potatoes. 2. Add soya granules or chunks to 3 cups of hot water. If you use a pressure cooker for steaming veggies like me, you can just use up the hot water used for steaming. Drain them and squeeze off the water. Rinse twice in fresh cold water and squeeze off the excess water. If using chunks then you will need to pulse them a few times to get a coarse texture. 3. 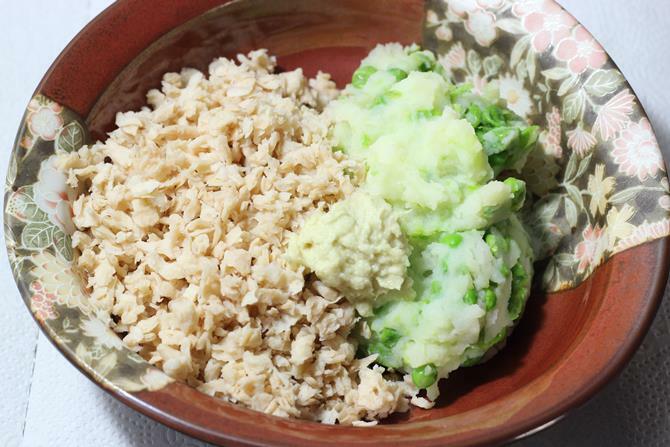 Mash the potatoes and peas. Add the drained soya, ginger garlic paste to a mixing bowl. 4. Add salt, garam masala, coriander powder, chilli powder and pepper powder. Mix up all these well. 5. Dry roast besan / chickpea flour until it begins to smell good. Add it here. Do not use unroasted or raw flour. Mix up everything again. 6. 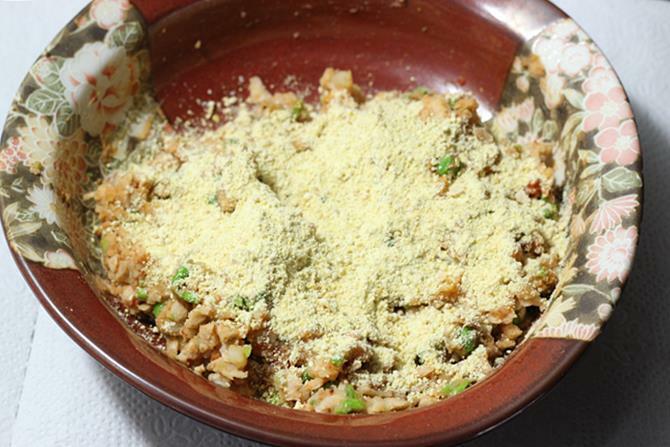 The mixture must come together and must not be soggy or crumbly. If it is soggy, then sprinkle little more flour and mix. 7. Divide the mixture to 9 equal parts. Roll each ball to the skewer as seen in the picture. Do not make them too fat otherwise they will not be cooked from inside. 8. 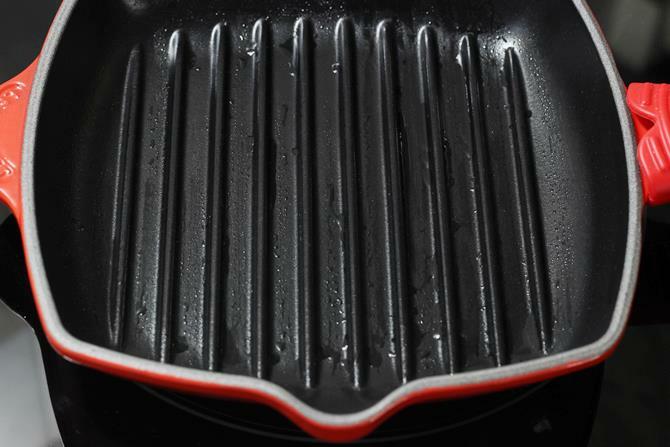 Heat your grill pan with 1 tbsp oil greased or preheat the oven to 220 C for about 15 mins. You can also fry them in cast iron pans, barbecue or do it on charcoal grills. 9. Place them on the hot pan. Grill, while rotating the sticks every 7 to 8 mins. If doing on stove top keep the flame to medium. 10. When they are half done, place a slice of onion on the grill or pan. 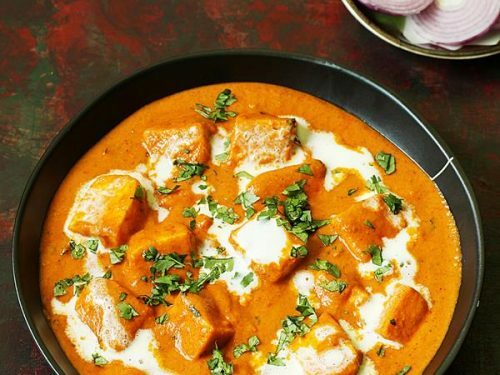 This emits a very good smoky flavor and the kababs absorb the flavor. Towards the end, increase the flame to the highest and grill for 2 to 3 mins. If doing in oven, move the pan to the top rack and grill the last 5 mins. It takes about 25 to 30 mins for each batch to be done. 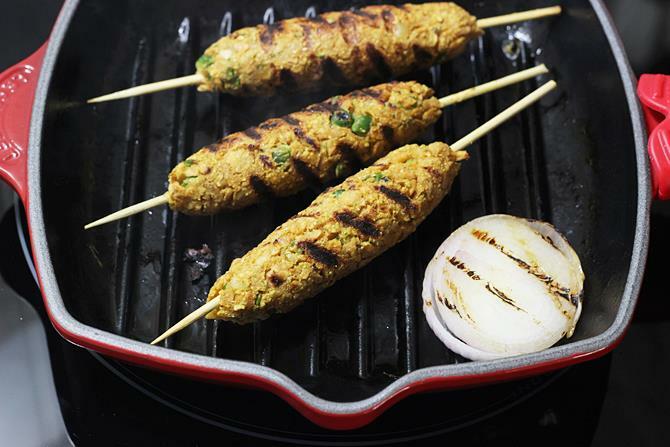 If making mutton/ chicken seekh kabab you will have to grill for about 30 to 35 mins. 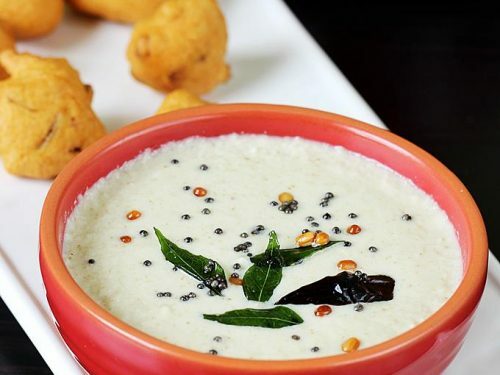 Serve them with onion & lemon wedges. I will try to share it. Thanks a lot for reading Swasthi’s Recipes. Thanks for the mention. I forgot to mention sweet potatoes as the substitute for potatoes. Will update it. Since when? I am diabetic and potatoes have been recommended for their fiber content. 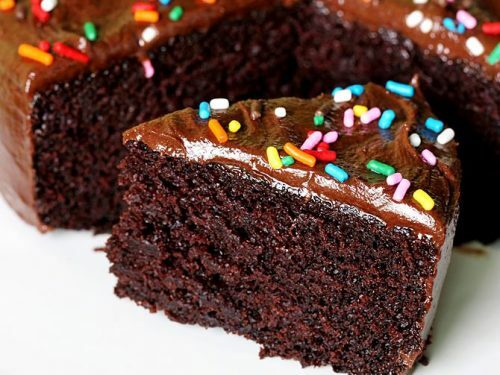 delicious recipes there I love it!! I had made this dish for my in-laws and they loved it. Since my in-laws are into organic food they asked me to use organic soyabeans. Initially I was confused about the taste but using organic soyabeans actually added taste to the dish. 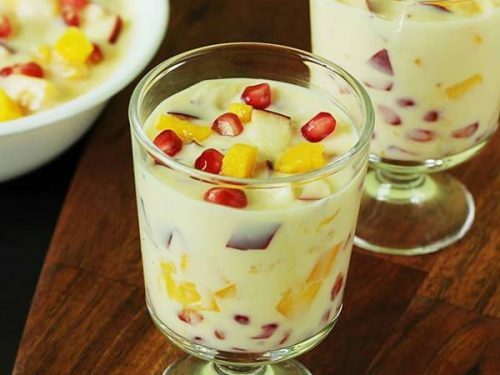 I am glad I read this recipe here and made it one fine day. Thank you so much for the delicious recipe!